Pakistan’s famous all-rounder Shahid Afridi congratulated Chairman PTI Imran Khan on his second marriage after meeting him. Shahid Afridi congratulated Imran Khan in Bani Gala for his 2nd marriage while he was offered sweet, coffee and Bar B Q during the meeting. 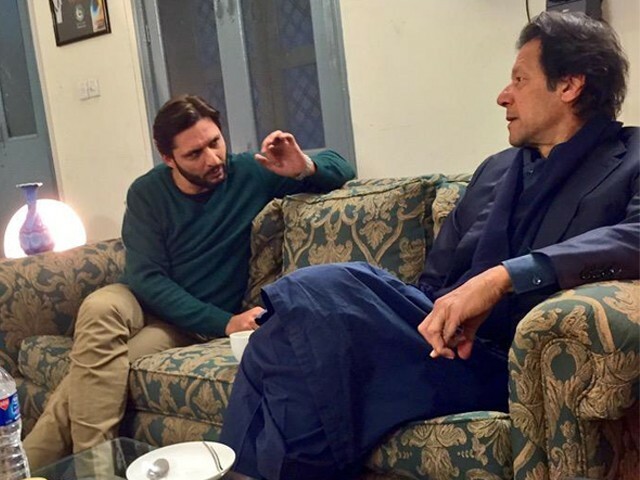 During that occasion, Imran informed Shahid Afridi about the performance of PTI in KPK province and also gave him few tips about the upcoming world cup 2015 that will start next month. In this meeting; PTI MNAs Shehryar Afridi and Murad Saeed, ministers and members of KPK assembly and Imran Khan’s spokesman Naeem ur Rehman were also present.